After recent comments from Bill Sutherland (Highgate Harriers) pictured left by Jim Coomber and printed in 1967 RWR, who raced in Guernsey many years ago, its time to reflect on the clubs early days. After the formation of the club in late 1964 and the first race in 1965, the island attracted British walkers to compete against the locals. The most well known was probably Paul Nihill from Surrey WC who won the silver medal in the 1964 Olympic Games and raced in the 1968 Church to Church walk as a preparation for the 1968 Games. He duly won the Church to Church in a record breaking 2.43.19. Another Olympian from the 1964 Games, as well as representing GB in European competition and England in the 1966 Commonwealth Games (which had a different title in those days) was Ray Middleton, who was to become a team mate of both Len Duquemin and John Moullin in Belgrave Harriers colours. Ray raced in the 20 miles West Show walk in 1967 in 2.43.35 on a tough course, still an allcomers record. Scotlands Bill Sutherland, whose claim to fame came in 1970 in the Edinburgh Commonwealth Games, where he finished in the bronze medal position in what for him was a home event, made his debut in Guernsey on September 15th 1966 at the age of 21 years. He came to Guernsey having raced a few weeks earlier in Wales and covering the 7 miles course in a winning 51.15. He would be tough opposition for the local walkers. He duly won the Guernsey 7 miles race in an Allcomers Record time of 50.31 on a very warm evening ahead of Len Duquemin, the leading Guernsey walker. Bill went through 3 miles in 21.35 and 4 miles in 28.56. The course was from Houmet to South Esplanade, St Peter Port. Eddie Robins, Sarnia Walking Club official wrote in Race Walking Record about the course ” course measured with a wheel borrowed from States Telephone Council, corrected and tested, so much so it was measuring inches let alone feet accurately. A further test had been made on a Police testing area of 880 yards, which had been tape measured. The wheel clocked up exact measurement to the inch” . 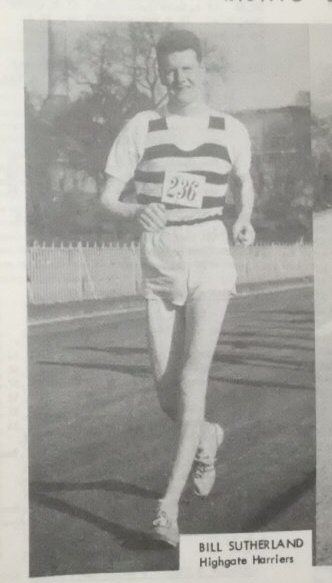 Months later in April 1967, Bill returned to race, but revenge was sweet for Guernseys Len Duquemin who strode home first in 36.40 (4 miles in 29.12) setting a new Guernsey Record in a 5 miles race from Lancresse to the White Rock harbour. Bill Sutherland was a distant second in 37.45 ahead of John Moullin in 37.50. Amongst the field of 22 men and woman were Dave Dorey and Mick Le Sauvage who are still racing in 2013. Dave finished 10th in 42.33 and Mick 11th in 44.22.